My life as a carer, and a very special day! I feel that the time has come to say a little more about that most important period in my life, the years between 1981 and 1997, when my life was fully occupied in caring for my mother and our activities for and on behalf of disabled people. 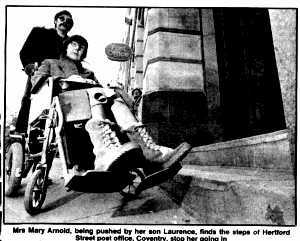 It was a couple of years after moving into Starley Road that my mother first rose to prominence in the Disability movement in Coventry when she led a demonstration from her wheelchair (with me the pusher of course) and was featured on the front page of a local newspaper. That story is told in more detail on my tribute site to her, but it led to our growing involvement with Coventry Council of Disabled People as a natural follow up from the benefit shop, which it rose to be our main concern in life. It gave focus to my mothers life, as otherwise she had nothing to do, and it gave something of an outside focus to my life as well. 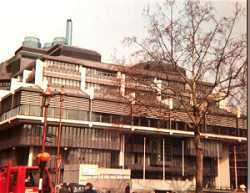 To begin with I was the first secretary of the Coventry Council of Disabled People, a position which I took almost incidentally as I was one of the keener and younger ones at the first meeting, and at first my work there was supporting the original chairman, a blind man called David Kelly. When he resigned to start up his own business in bicycle repairs, I also resigned to let my mother take over the chair, which nobody has ever been able to do better than her. My role was then more subsidiary while she took up the public limelight, as an able communicator of ideas who had the press sympathy and public support. I was of course always behind her or with her but my main contribution was in seeing that she arrived at meetings, organising and getting ready what she needed, and doing all the background with all the research and preparation for her. Much in the way that most successful M.P's have their researchers and spin doctors nowadays. I was also somewhat known for my opinions voiced in the Trunk Calls newsletter, which I produced, using the knowledge I had gained at University and new skills I was learning all the time on the computer, to enhance my capabilities and save time, as so much was needed in the physical care that my mother needed. Being a person who does not sleep much helped a great deal as I could work on many things late at night, while my mother was in bed. My public appearances however were not so successful. I was and am always full of passionate feeling for the subject, but my communication skills always let me down. I would get heated and perseverative in my arguments, and even somewhat aggressive at times, which I will readily admit did not always prove an asset to the organisation or to my mother, who had to either put up with me or explain it away in her more diplomatic fashion. I feel I am still suffering from the harm I did to my individual reputation at this time, in the search for work in that particular sector in Coventry, because there is hardly an influential figure in the City who has not felt the force of my wrath at some time or other. Early on in this period, I recognised that it was a problem, and recognised some of the traits of my father in me. I sought professional help, but I feel that the problems were neither properly identified or addressed at the time. I felt that the psychologists and doctors wanted to change me as a person, and in the process take away the positive features as well as the negative features of my behaviour. The positive features being the depth of feeling I had about the subject and desire to make a better world for others. And my single minded dedication and perseverance in the subject, to the extent that I was quite prepared to put my physical health in jeopardy as well. Above all I turned inward and became excessively self reliant, not letting others interfere in our lives at all. My mother too shared this obstinacy, which enabled us to achieve some great things together as well as to pay the price for both of us, both in terms of health and mental well being. One of our best achievements was the research we put in together into transport, which led to an extraordinary day in both our lives. To begin with my mother was without a car in a world which was not designed to carry disabled people on public transport. 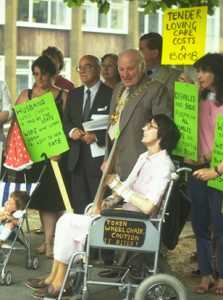 She campaigned against the taxi and bus companies, whilst I did as much research as I could into putting together a document designed to influence the Social Services in Coventry into putting more money into the most appropriate means of transport for everybody, rather than segregating it off into an ill funded minority system. My mother was all for that as well. She sat on the committees while I fed her the material, which gave her words so much more force. As it happens the production of this report coincided with much else that was going on in public transport at that time. I had already submitted a paper anonymously to the European Ministers of Public Transport as a result of a request from somebody we had met at a conference on Community Transport, and I had expanded this a great deal. I was actually called upon to present this document to another committee in Birmingham which I and my mother often attended as observers, showing that there was at least one person in a wheelchair who bothered to hear what decisions were made on her behalf. 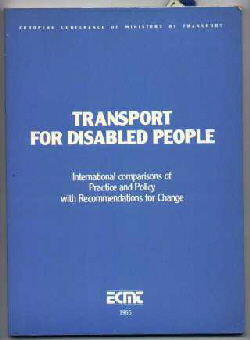 We polished up this paper a bit and sent it off eventually to the Department of Transports Disabled Persons Advisory Committee, when we heard at the other committee that they had put a call out for general papers. It was obviously best to put it out as a joint paper as my mothers name had more standing than mine, as I was just seen as her somewhat socially awkward and bad tempered carer. To our surprise it was taken up as one of the few selected for a fuller hearing. That is to say we were summoned to a meeting of the DPTAC in London where my mother was to present the paper and answer questions on it. This was a great honour as all the other papers came from well resourced public bus companies, and local authorities. You can read that report on my other web site. Transport to London was no easy thing at that time. Fortunately as we lived close to the station it was only a short walk for the first stage, but in those times it was still commonplace for wheelchair users to have to travel in the goods section of the train without heat and amongst all the parcels and sacks of letters. As for the poor companion (me) well as there were no seats you had to stand for the whole journey. When we got to London, a taxi had supposedly been arranged, by the ministry of transport no less to pick us up. There were some Taxis capable of carrying wheelchairs then, but not many. We waited for what seemed like hours and nothing came. I made desperate phone calls to the company and the ministry to find out what happened, and still none came. I phoned up alternative companies and still none came. In the end it was by chance that we found our way. 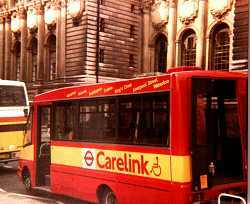 At this time outside of Euston Station there was a new service starting in special minibuses designed to take disabled people between the London stations as wheelchair users were neither able to nor permitted to use the underground system. I was able to arrange for this service to make a slight diversion from there circular route to drop us off at the Conference Centre, considering the nature of the event we were due at. This service was run by London Transport and they were so pleased to have their first ever wheelchair user on the service, as this was in fact its first day. Not only that it just so happened that they had a reporter on board from Capital Radio to record the comments of the first user, who just happened to be my mother. What a turn out. Eventually and somewhat late we arrived at the prestigious Queen Elizabeth's Conference Centre which is close to the Houses of Parliament and Westminster Abbey. Normally as this hosts all manner of high level conferences it is protected by a high level of security and all baggage is screened like at an airport. It was quite a sensation to be whisked straight through this as if we were high level diplomats. And in order to make up for the mistake in the taxis a special lunch was arranged just for us, with butler service! like at a top hotel. My mother did of course have to sing for her supper by presenting the report with me at her side ready to turn to the relevant pages. It was well received and I really do think it helped to influence the thinking toward the more widespread adoption of accessible buses in mainstream transport systems as well as promoting the case for accessible taxis. As proved by the difficulties of the journey even getting there which reinforced the point like nothing else. It was well worth all the trial and tribulation, as our reception justified it all. It was a day I shall never forget, and there will never be another like it !